nasty online gossip and chat. I am being cyberbullied—how do I stop it? remember you didn’t ask for this—nobody deserves to be bullied and you will get through this. Most schools have policies in place to address cyberbullying and should be able to provide support to you and other students, no matter whether the bullying is from a student at your school or not. Talk to a teacher or counsellor you like and trust. What if a friend is being cyberbullied? What if the cyberbullying material is still there? Social media services should remove cyberbullying material that is reported to them. Most social media services have a reporting area on their website. Our Social media safety centres page also provides information about how to report material on various services. Depending on where the cyberbullying material is posted, you might need to do this first, before you report it to the site. A simple way to collect evidence is taking a photo or screenshot of the material. If you submit a complaint to us about the cyberbullying material, you will need to provide this evidence. 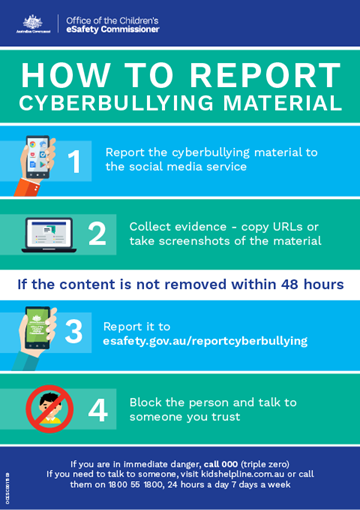 If the social media service fails to remove the material within 48 hours of you reporting it to them, you can make a complaint to the Office of the Children’s eSafety Commissioner. We recommend that you block or unfriend the person upsetting you, so they cannot keep upsetting you while the material is being removed.